This painting is a tribute to the love of a mother. 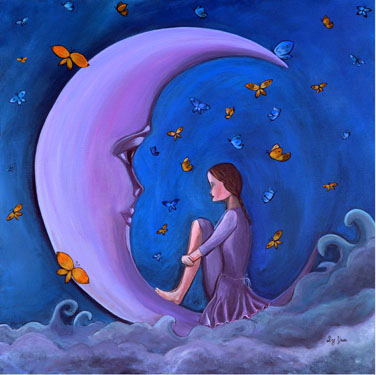 I used the moon as the symbol of motherhood and the butterflies as the beauty of that special connection. My mother and I had a different relationship, I was separated from her since I was seven due to schooling circumstances. In our Chinese culture the word “love” is rarely spoken, it’s a sacred emotion that is rarely expressed verbally . Although my mom seldom tells me that she loves me, I know from her actions that she does, the bond between us is undeniable, I guess actions do speak louder than words and I know that my mother truly loves me unconditionally.